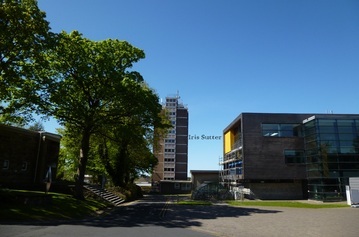 The University of Cumbria is located in several campuses: in Ambleside, Lancaster, in Barrow-in-Furness, four in Carlisle, one at Energus Workington, at Newton Rigg College (Penrith), and another at Tower Hamlets. Cumbria is the England's newest University. It wad founded by the St Martin's College in 1964. 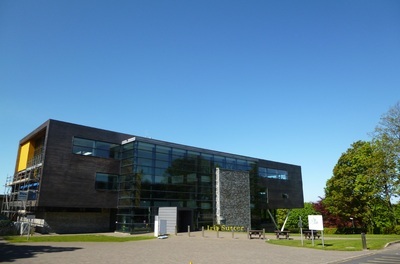 The University of Cumbria provides diverse Course Subjects like Business and Computing, Creative Arts, Education, Health and Social Care, Law and Social Science, etc. I am currently studying in the Lancaster Campus which is located at Bowerham Road, a fifteen minute walk from the town centre. The University is quite small as it gathers approximately 15.000 students. 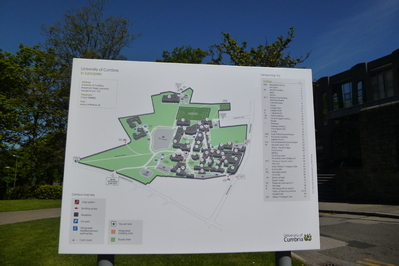 So the Lancaster Campus is not very big but we can find Catered Hall of Residence, catering sites like the Canteen, the Café Martineau and the Snack Zone, and a Sportive Complex with a fitness room, a court for basketball, handball, volleyball, and badminton. There are also two external courts to play football and other sports. The site offers a nice environment, with several trees, lawn areas, it also mixes old buildings with recent buildings which induces a diversity of architecture quite interesting. About the residence, the University provides two types of Residence, the self-catered hall of residence situated off campus and the catered hall of residence on the campus. I live in a self-catered hall of residence called Mill Hall at twenty minutes from the campus. My semester began on the 21th January but the previous week I attended to an Induction week for the International Students, where different persons of the University (Students, Teachers, and Officers) explained us the Life in Cumbria, skills support, and how to use and benefit from services provided by the University. Three French from ESDES, a German boy, an Australian, a Canadian, an American and an English who left the induction program after one day. But a Finnish girl came in the middle of the week. On Wednesday, we attended to an International Welcome Reception where we were all eight students with Cumbria staff and a member of the Student Union. We got a quiz and food for free. It was a good evening, and for the first time I tasted the Famous Fish&Chips! On Thursday, we went to see a drama in The Duke Theatre, it was called Lady Windermere’s fan. It was a pioneering drama and the Theatre is very original because the stage is situated in the centre of the room and the audience is sitting around the stage. This Induction week was a good way to adapt to this new University and culture, to meet other International students and to discover the town and the campus. and Researching the Marketing Environment. I have three hours of lecture for each module, which induces nine hours per week, my courses only occur on Monday and on Tuesday. However I have a lot of homework to do and courseworks to submit during the semester. We are not numerous in the modules, classes are composed by 12 or 18 students where everyone can speak and participate during the course. My classes assemble different nationalities, cultures, and age groupes. Indeed, for example in Enterprise and Personal Development there are International Students: two Malaysian, two French (me and another girl of ESDES), a German, a Netherlander, and an Indian, plus two English; there is also a woman who is working and has a family. In International Marketing Strategy we don't have a final exam but we must write a report for the 14th March and an essay for the 26th April. In Enterprise and Personal Development we do not have final exam either but a report to do in 3 parts. In Researching the Marketing Environment we do have a final exam plus a report to do about the marketing searh we will do on catering customers attitudes on Lancaster Campus.